Helping hand: Students from St Joseph’s, Nudgee College raised $10,000 by competing in the Great Wheelbarrow Race. The Nudgee boys won the schools division. With many students from rural Queensland the school has energetically supported families struggling through sustained drought. QUEENSLAND Catholic schools are digging deep to aid struggling farm families caught in the long drought. Fundraising to buy groceries and feed livestock, and waiving school fees are some of the efforts being offered to families facing financial hardship. Term-two school fees were waived at Catholic primary schools in Longreach, Barcaldine and Blackall. Some of Brisbane’s elite Catholic colleges with long histories of helping country boarders have extended the time for school fee payments and offered bursaries to keep country students in school. “Our Catholic schools have done a really good job of looking after isolated families,” Australian Boarding Schools Association executive director Richard Stokes said. Mr Stokes, who has visited some of the worst drought-affected hotspots, said about 4000 boarders attended schools in Brisbane from across Queensland and northern New South Wales. “In Longreach … the park at the end of the main street, at dusk you couldn’t see the green for the kangaroos. That tells you it’s bad,” he said. “It’s not that the families want handouts. They just want opportunities to be able to make sure their kids still get an education and that they can have support along the way to make that happen. “The country businesses are struggling in the same way. In Rockhampton diocese, primary schools and colleges have contributed to drought fundraising with lamington drives and “dress as a farmer” events with proceeds used to buy vouchers for families to spend at local food and grocery stores. “The spirit and generosity of our Catholic Education family has certainly shone through during this appeal,” Rockhampton Catholic Education director Leesa Jeffcoat said. 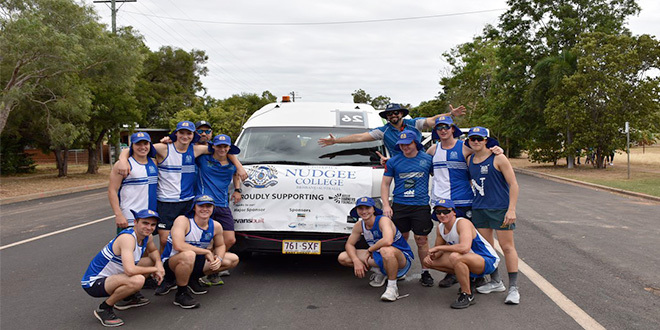 At Nudgee College, with a high number of country boarders, students recently raised $10,000 through a sponsored event and from barbecues. The main fundraiser involved a team of 10 students competing in “The Great Wheelbarrow Race”, covering 133km from Mareeba to Chillagoe in the Atherton Tablelands. The money raised went to the Aussie Farmers Foundation. “It fits in with our values of keeping an eye out for others,” Nudgee College director of identity Anthony Connellan said. Eleven kindergartens run by Centacare child care services have also raised thousands of dollars to “buy a bale”, with children baking cakes and cookies and then dressing up as farmers to sell them at community and parent events. On September 21, Prime Minister Scott Morrison pledged that extra funding handed to Catholic schools would go toward lowering fees for students in drought-affected areas.